To be a good cook is to be a good eater, and vice-versa. I was raised in a restaurant, but cook mostly for myself. These are my thoughts and adventures relating to food. On the way to work this morning, I was reading an SF Chronicle article about a new burger place that had opened up. 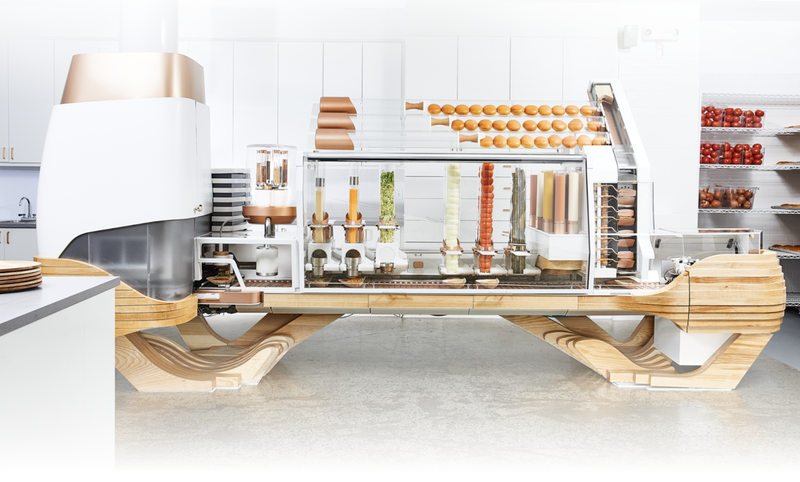 What was interesting here was that it was apparently the latest foodtech startup to capitalize on a growing trend of automation. 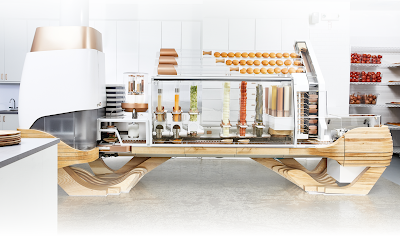 Over the years, we've seen many aspects of retail food become automated: payments, delivery, even service. But has there ever been a solid effort to create an end-to-end food preparation, and further, one that took on the venerable burger (the quintessential, go-to American food)? I was asked by a friend for some recipes based on one of the dishes that I had mentioned as a part of the Chinese Phood trilogy. This got me thinking, perhaps it may be a good idea to start including DIY instructions whenever possible. Now, I intentionally used "instructions" instead of "recipe" because I don't really use recipes. To me, Chinese cooking is increasingly becoming a state of mind, a philosophy of food preparation, as opposed to any set repertoire of dishes. So I'll add some basic directions, and assuming you have any skill at all in operating a large skillet or wok without getting burned, modify to your heart's content. Introduction: I was asked by a friend for some recipes based on one of the dishes that I had mentioned as a part of the Chinese Phood trilogy. This got me thinking, perhaps it may be a good idea to start including DIY instructions whenever possible. Now, I intentionally used "instructions" instead of "recipe" because I don't really use recipes. To me, Chinese cooking is increasingly becoming a state of mind, a philosophy of food preparation, as opposed to any set repertoire of dishes. 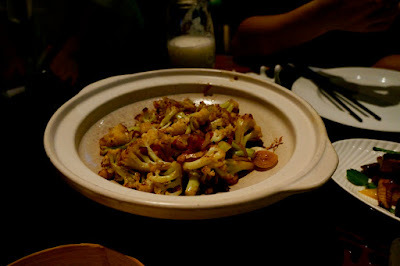 This is Part 3 of my Beijing food non-odyssey. Make sure to check out Part 1 and Part 2 first! So, aside from the more formal dining experiences, I wanted to end this with some real-deal food experiences. I mean, real northern Chinese goodness. Which is why, the morning that I was flying back to SFO, I specifically requested a visit to a Northeastern style restaurant. Now, it's important to point out that in the Northeast, we friggin love our stews. 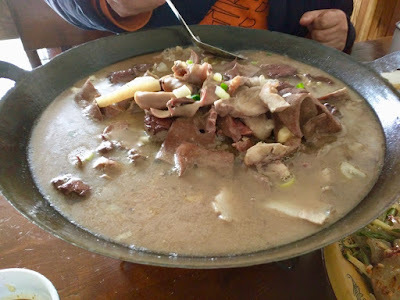 And offal makes awesome stew. Here, I present to you our sauerkraut stew with pork innards (WARNING: not kosher). 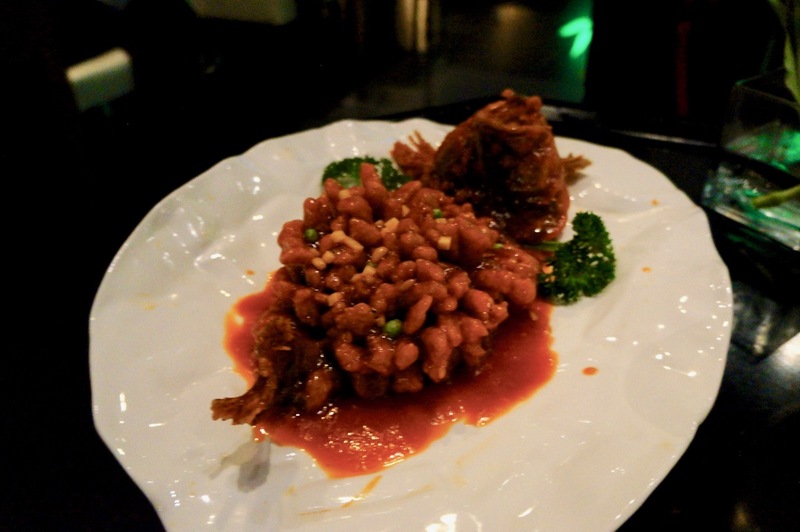 Here's Part 2 of my Beijing food non-odyssey. Make sure to check out Part 1 first. 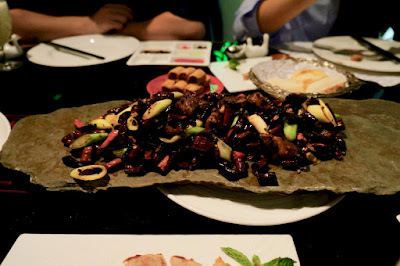 Ah, the Sichuan wok-tossed Maine Lobster, no doubt utilizing a creature indigenous to China and prized by cadres nationwide (confession: probably only one of those is true). 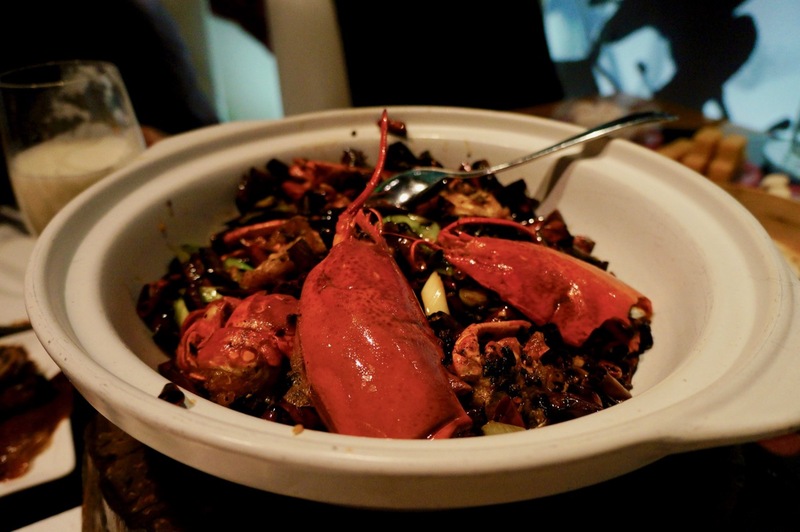 I've had chili crab a few times, but something sits weird in hindsight when you consider that Sichuan is one of the furthest removed places you can think of re: lobster. The second thing is that when you think about it, most of what you see is inedible. I mean, 85% of that dish was shell and dried chili peppers. Feels to me like one of those things that's supposed to be a show of opulence, rather than anything that people actually enjoy eating. Find out how to make this dish yourself. Notice they put the slate on a plate. The plate has a plate. Here's an interesting one - chili steak cubes. If it looks familiar (i.e., compared to the first dish above) it's because as far as I can tell, it was finished in pretty much the exact same way. It was actually pretty tasty, and I'd say that unlike the former dish, the beef here probably represented a healthier 50% of the net weight here. But that's not the weird thing. The weird thing is that they served it on a slab of slate. Nice presentation, but as a former dishwasher I started wondering how well they could wash one of these things. Why, you'd have to do it by hand, and I don't think those kids are paid well enough to care too much about slate-related hygiene. Find out how to make this dish yourself. So here we have the third dish, which is a twice-cooked rib and mushroom dish. The first thing you may notice is that the dish is actually kind of small. 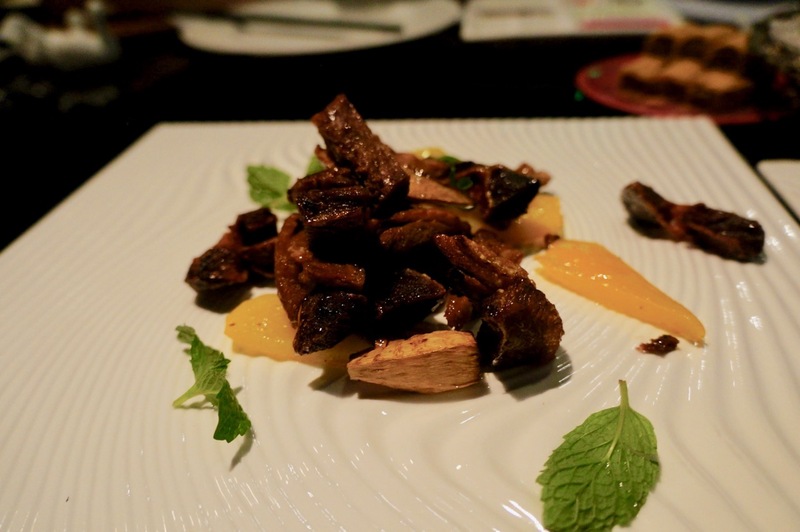 That's because the mushroom is not just any mushroom, but the highly prized matsutake variety. They're big, meaty, and pungent - and pretty expensive. Which is probably why there were only a couple pieces in the entire dish. But hey, there are a couple mint leaves, so that's nice. Plus, there are some yellow peppers, too, which look like the matsutake. Well, a little, right? Anyways, as a carnivore I probably still preferred the ribs, but those mushrooms were that one mushroom was delicious. Find out how to make this dish yourself. Looks like something I'd make. Now here we're getting into more traditional territory. which is to say that it's something I'd often cook/eat myself. Stir-fried cauliflower, soy sauce base, and some fresh garlic. Voila. I was pretty happy that someone decided to balance out the meats/seafood with something more sensible for my colon (as I'd do at home). These cauliflowers look a little forlorn, but the flavor was totally on-spot. Dishes like this give me hope that I can one day go vegetarian for longer than a month. Find out how to make this dish yourself. Ok, here's the last one. Once upon a time, when I was a little kid, I tagged along for a meal where someone ordered this sweet and sour fish. Now, you may have heard many Chinese friends tell you how inauthentic "American Chinese Food" is. And that we don't really eat Sweet & Sour and Moo Shu. Well, sometimes we do. In fact, sweet & sour dishes are a hallmark descendant of Shandong (Lu) Cuisine, where strong, bold flavors are a necessity. Anyways, back to the fish. Someone in the party (not me) ordered this. and what you see in the picture is the body of the fish sliced into thick stripes, all still attached on one end like a blooming onion. Then it was deep-fried and quickly covered with the S&S sauce. It was exactly like I'd remembered. So there you have it. I'm surprised every time I go back to China, because things just keep on changing. 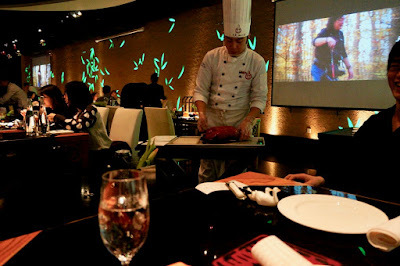 Restaurants get fancier, presentation gets upgraded, and Chinese food gets a little... weirder. It makes me wonder what Chinese food was like 100, 500, 1000 years ago. I'm a strong proponent of someone making this a major concentration at Harvard. Make sure to check out the final segment of the 3-part series! These are from my last trip to Beijing, which I've been lazy about uploading. But you know I wouldn't leave you hanging forever, right? Now, let's talk northern Chinese food. PSA: Eating these will not make you skinny. ... but NOT EATING these could. © 2015 AndrewJing.com. All Rights Reserved. Ethereal theme. Theme images by MvH. Powered by Blogger.